Journalism is dead. It wasn’t murder, or old age, it was suicide. Journalism died after drinking a cocktail of contempt, arrogance, ignorance, and enough narrative to kill a whale. Its corpse rolls on, meeting deadlines, publishing stories, and forming cable news panels continuing to extol the virtues of the poisons that killed it. They deserve your skepticism and your contempt. Subornation of perjury is a serious allegation for a “news” organization to make. At least it has become one in the years since Bill Clinton actually did it with Monica Lewinsky and Democrats didn’t care (it’s amazing what a difference party membership makes). If true, talking heads exclaimed, this would be grounds for impeachment of the President. 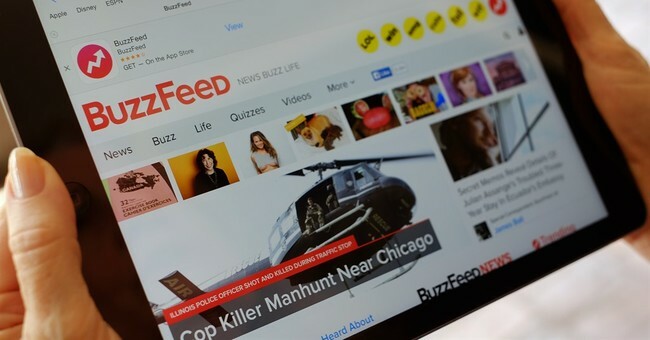 A second after Buzzfeed, the glorified blog known mostly for clickbait listicles and cat videos, published the allegations all presses were stopped. Newspapers and networks sent their reporters on a quest to verify the story, based on anonymous sources, for themselves. They couldn’t. Normally, if journalism were still a profession with standards, this “bombshell” wouldn’t warrant more than a mention unless and until it was able to be corroborated by someone, even an anonymous someone, by the other organizations. You can’t report on someone else’s anonymous reporting if you can’t get anyone to back it up. But these aren’t normal times. Every outlet ran the story, adding a casual mention of not having (yet) been able to “independently verify” it for themselves. A mere formality; it had to be true, after all, it was a story about Donald Trump, painting him as a criminal – the top item on Christmas lists in newsrooms from coast to coast. All of Friday was consumed by this story and its implications. Meanwhile, no one was able to verify any of it. The two reporters who “broke” the story were immediately booked on cable news to be celebrated as conquering heroes. And they immediately contradicted each other on the crucial question of whether or not they’d actually seen documents proving their story with their own eyes. One said they hadn’t seen any proof themselves, the other said they did. It can’t be both. No one took a knee when those flags were raised, they all saluted and continued an endless series of hypothetical discussions predicated on a story no one at any news organization could back up. I’d be shocked if several of the participants didn’t win Pulitzer Prizes. Journalism went to Hell courtesy of what its practitioners view as its shining moment – Watergate – and it hasn’t looked back since. And there is a lifetime of rewards awaiting whoever claims the scalp under the golden coiffed locks resting atop Donald Trump’s head. Its pursuit has perverted the profession more than anything before it, and this time they thought they had it. Late in the evening on Friday, in an extremely rare move, Special Counsel Robert Mueller’s office broke their long-standing silence to issue a statement on the story, a strong statement of denial. “BuzzFeed's description of specific statements to the Special Counsel's Office, and characterization of documents and testimony obtained by this office, regarding Michael Cohen's Congressional testimony are not accurate,” the statement read. Mueller could have remained silent, could have let the story peter out the way so many others have, but he didn’t. He drove a stake through its heart, rendering the entire day’s news cycle yet another fake news fever dream. No, Mueller didn’t do the media any favors; it’s not his job to take the media’s side. It’s not the job of the media to have a side, or course. If journalists worry so much about their reputation, maybe they should try to remember that because the rest of us sure will.